Iran tested its first nuclear power plant Wednesday, a stride that prompted one Iranian technician to declare it was "independence day" for the Islamic republic. 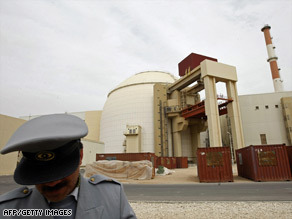 Tests were carried out at the Bushehr nuclear power plant using “dummy” fuel rods, loaded with lead in place of enriched uranium to simulate nuclear fuel. In a news release distributed to reporters at the scene, officials said the test measured the “pressure, temperature and flow rate” of the facility to make sure they were at appropriate levels. Officials said the next test will use enriched uranium, but it’s not clear when the test will be held or when the facility will be fully operational. “Of course we’re proud. Our power plant is on its way to being ready,” engineer Mohsen Shirzai said. “We’re definitely proud.” The test was observed by the head of the Russian nuclear agency, Sergei Kiriyenko, and the head of Iran’s nuclear agency, Gholam Reza Aghazadeh. Iranian officials bused in around 70 journalists for the test run and a tour of parts of the power plant. In 1998, the Iranian government signed a Russian company to a $1 billion contract to finish building the power plant. Construction of the plant began in 1974 under the late Shah of Iran, but it was halted at the start of the Islamic Revolution in 1979, and its completion has long been delayed. Russia’s nuclear power equipment and service export monopoly, Atomstroiexport, is building the plant under the supervision of the International Atomic Energy Agency, the U.N. nuclear watchdog agency. The United States, several European nations and Israel suspect Tehran has been trying to acquire the capacity to build nuclear weapons, but Iran has said its nuclear program is solely for peaceful purposes. Watch the world’s reaction to the nuclear plant test » Kiriyenko, quoted by Interfax, couldn’t name the commissioning date of the nuclear power plant. He also said that Russia and Iran were planning to sign a contract soon “for the delivery of nuclear fuel during a period of at least 10 years,” Interfax reported. Last week, the Washington-based Institute for Science and International Security released a report stating that Iran has reached “nuclear weapons breakout capability” — it has enough uranium to make a nuclear bomb. The report was based on an analysis of IAEA data. However, an IAEA official who asked not to be named cautioned against drawing such dramatic conclusions from the data, saying Iran’s stock of low-enriched uranium would have to be turned into highly enriched uranium to be weapons-grade material. That hasn’t been done, the official said. Hassan Qashqavi, a spokesman for Iran’s Foreign Ministry, denied accusations that Iran intends to make a nuclear bomb. “Based on our religion and our human values, we totally reject all kinds of using all these WMDs, weapons of mass destruction, especially nuclear bombs,” Qashqavi said in an interview this week with CNN. “We would like our Western friends to recognize our undeniable right to reach this technology peacefully,” he added.